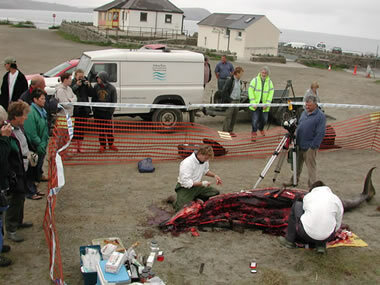 The UK Cetacean Strandings Investigation Programme (CSIP) as it is now known is a consortium of four separate organisations. 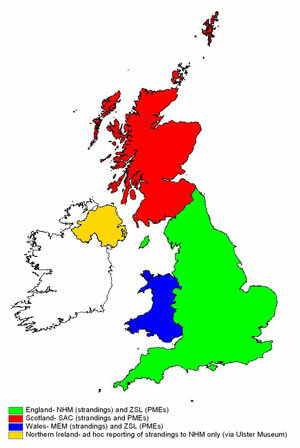 The CSIP is presently jointly funded by Defra, Welsh Assembly Government and Scottish Government. A Steering Group consisting of representatives of UK government and Joint Nature Conservation Committee (JNCC; managers of the current contract) monitor progress and provide guidance on the objectives and output of the CSIP. The organisational structure of the CSIP and the responsibilities of each organisation are shown below. Every year, between 550 and 800 cetaceans are found stranded around UK shores (2003-2007 stranding data). Most are dead, but some are still alive and more than 13,000 stranded cetaceans have been recorded in the UK since records began in 1913. The figure below shows the number of individual species found stranded during the five year period between 2003 and 2007.